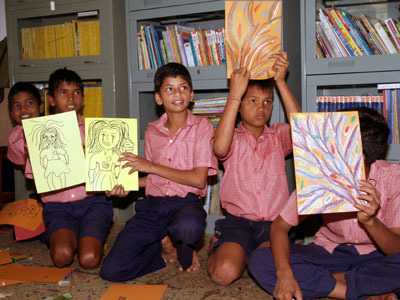 Room 13 Aseema – An Education Centre for Underprivileged Children – believes in and subscribes to the art philosophy of Room 13. 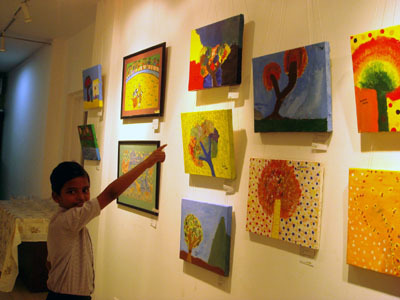 Aseema Room 13 was officially opened in August 2006 and since then the young artists have worked with visual and performance artists to create original artworks, held exhibitions of their work and completed commissions for corporate companies in India and overseas. Aseema is a Mumbai based non-governmental organisation with a mission to provide underprivileged children with a nurturing and stimulating educational environment that helps them recognise their limitless potential. Since 1997, Aseema has been providing holistic and relevant education to Mumbai’s most neglected children – children living on the streets, or in slums and in inhuman conditions. 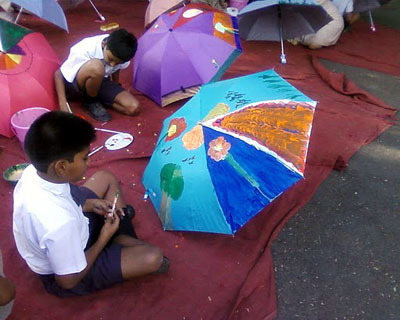 In partnership with the Municipal Corporation of Greater Mumbai (MCGM), they support three municipal schools where children receive high quality education. In addition, children can access a support centre, where they can spend their evenings studying. Aseema are also reaching out to the tribal children in the villages of Igatpuri through the Sitabai Kavji Mengal Anganwadi at Jambhwadi and the Aseema Bal Shaikshanik Kendra at Awalkheda. Aseema originally introduced Room 13 in Pali Chimbai Municipal School, Bandra, Mumbai. The programme now extends to involve children across a range of locations and centres that Aseema has been developing. Indian fashion house Global Desi has teamed up with Aseema Room 13 to launch a new collection of trendy kurtis, tops and tunics featuring paintings by the young artists.